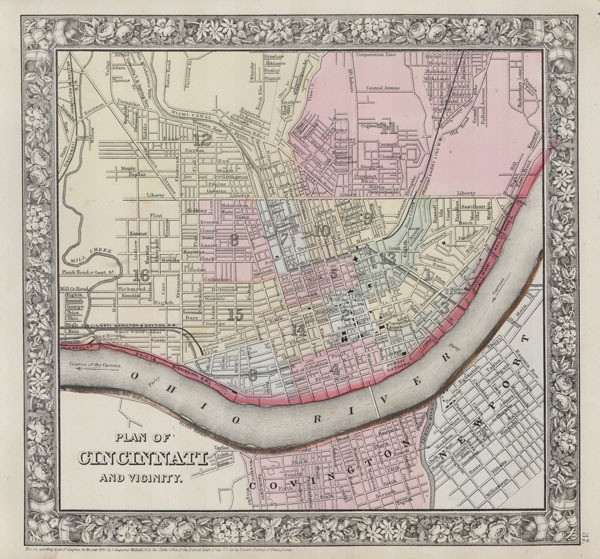 Plan of Cincinnati and Vicinity. Samuel Augustus Mitchell (March 20, 1792 - December 20, 1868) began his map publishing career in the early 1830s. Having worked as a school teacher, Mitchell was frustrated with the low quality and inaccuracy of school texts of the period. His first maps were an attempt to rectify this problem. In the next 20 years Mitchell would become the most prominent American map publisher of the mid-19th century. Mitchell worked with prominent engravers J. H. Young, H. S. Tanner, and H. N. Burroughs before attaining the full copyright on his maps in 1847. In 1849 Mitchell either partnered with or sold his plates to Thomas, Cowperthwait and Company who continued to publish the Mitchell's Universal Atlas. By about 1856 most of the Mitchell plates and copyrights were acquired by Charles Desilver who continued to publish the maps, many with modified borders and color schemes, until Mitchell's son, Samuel Augustus Mitchell Junior, entered the picture. In 1859, S.A. Mitchell Jr. purchased most of the plates back from Desilver and introduced his own floral motif border. From 1860 on, he published his own editions of the New General Atlas. The younger Mitchell became as prominent as his father, publishing maps and atlases until 1887, when most of the copyrights were again sold and the Mitchell firm closed its doors for the final time. Rumsey 0565.022 (1860 edition). Phillips (Atlases) 831-16. New York Public Library, Map Division, 1510815.